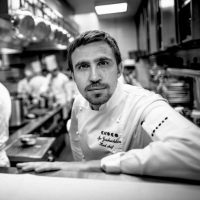 Igor Grishechkin, Chef at the famous Cococo restaurant in Saint Petersburg, is one of Russia’s rising culinary stars. Igor comes from Smolensk, a sleepy town 750 km from Moscow. He moved to Moscow at an early and worked his way up in two very well regarded restaurants in Russia’s capital city: Italian Casta Diva and French Ragout. His breakthrough came after moving to Saint Petersburg in 2012, when he took helm at the famous CoCoCo restaurant.